After a string of highly publicized bicycle fatalities in New York City, there is a noticeable effort to make cycling safer with signage and an educational campaign. The website Look NYC aims to change the behavior of both cyclists and motorists to create a culture of respect and safety. Of course that is easier said than done in a place like New York where some people will simply play by their own rules and put theirs and other lives at risk. Since arriving in NYC I've seen multiple bikers ripping right through red lights; as well as cab drivers, bus drivers and other motorists getting incredibly aggressive near bicyclists. But at least the city is trying to do something about it. 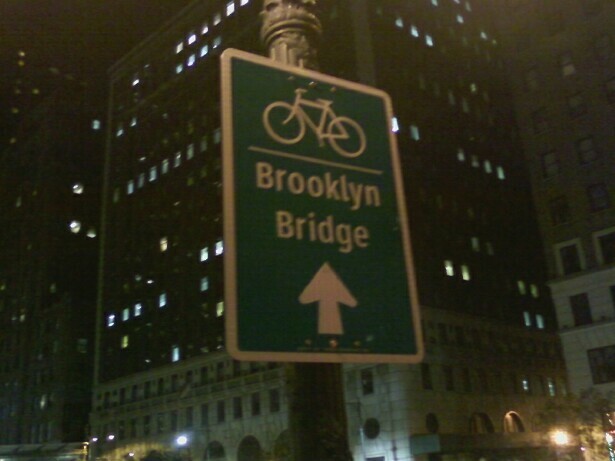 That said, overall NYC has become a great place for bicycling. There is a wonderful new bike path in Battery Park close to the WTC site that is well-marked and well lit at night with smooth pavement. It is just one example of the efforts New York City is making to become a bike-friendly metropolis. 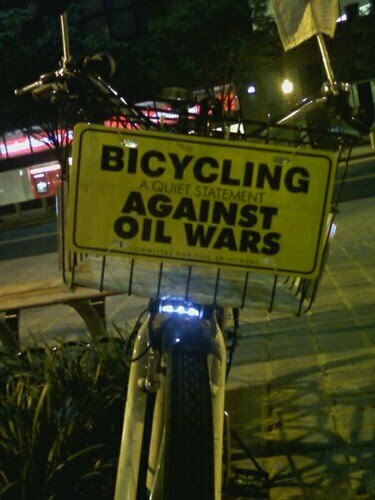 And of course this being New York, even biking can turn into a political statement as the picture below demonstrates. For more information on biking New York visit NYC Bike Maps, Bike New York and Ride the City.